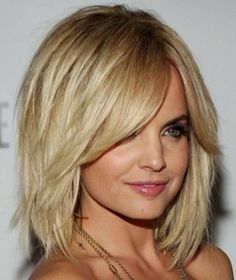 These beautiful shoulder length haircuts fall right at perfect spot to fulfill multiple looks. Straight and sleek, wavy and fun, or curly and cute – there’s certain to be a style right up your shoulder length alley! All the styles in this post display haircuts with minimal layers so you can see the beauty in a easy mid-length cut. Select to go for one of the hairstyles as is or customize your cut by adding shorter layers. Enjoy!